Whether you like it or not, if you’re in business, your customers are your best friends. Without them, you’re simply floating out there in the marketplace uselessly offering a product or service that nobody’s using. Among the best efforts you can make to build your business, therefore, are those that garner an increasingly large community of devoted customers who will always choose your business over all others to give them the particular products or services you offer. Community-building occurs in varying degrees. Below we’ve described those degrees, from the most ideal to the least. The difficulty many companies run into in regards to customer service is their own success. That is to say when an entrepreneur starts a business, it’s easy to keep customer service first since the entrepreneur him or herself is solely responsible for attending to those needs. But, as the company grows, more and more people become involved in the customer service process, and that is much harder to manage. Therefore, one of the best things an entrepreneur can do to make sure top-notch customer service throughout his or her company’s growth is to install a customer service system independent of any single representative. A good customer service system can include scripts for answering calls and emails, blueprints for handling certain common situations and methodologies for prioritizing customer concerns and assigning them to the most appropriate people. This ensures that every customer experiences the same type and degree of customer service, no matter which employee is assisting them. Hiring the right team is a key factor in achieving this level of uniformly superior customer service. An entrepreneur must hire employees who recognize the importance of customer service to every aspect of the business and its mission. No matter whether they interact directly with the customers or not, these types of employees know that every customer is their partner, no matter what role in the business that employee serves. Businesses that further build on these understandings and relationships, and develop them into an entire corporate culture, excel the most. Additionally, good leaders never shy away from direct interactions with the customers themselves, and, in fact, seek those opportunities out. The entrepreneur should show the attitudes and behaviors he or she expects from employees. At the same time, the entrepreneur should empower his or her employees to provide this impeccable customer service in the best manners the employees see fit, given the particulars of the immediate situation. When looking for amazing examples of customer service, look no further than Chewy.com, which was just acquired by PetSmart in the largest eCommerce acquisition ever (3.5 billion). How did they do it? Chewy started as nothing more than a large drop shipping store, not even selling any of its own products. But it evolved into a powerhouse thanks to customer service. In the words of founder Ryan Cohen, they aimed to be “Zappos on steroids”. (Zappos was considered to be the epitome of perfect customer service, thanks to CEO Tony Hsieh’s concept of Delivering Happiness). The entrepreneur should still remain aware, however, of the circumstances affecting their customers, so they can enact policies to improve those circumstances wherever possible. Policies that impede on any such abilities must be eliminated. If you can’t exactly commit to that level of impeccability quite yet, at least consider ways to include your customer in the various aspects of your company’s development. By soliciting customer feedback and incorporating it into your decision-making processes, you can, at least, give your customers some sense of inclusion and participation in the shaping of the business to better serve their wants and needs over time. This way, even though you may not be able to give them the exact degree of personal interaction on a day-to-day basis that they may like, your customers will still feel that their voices are being heard and valued. 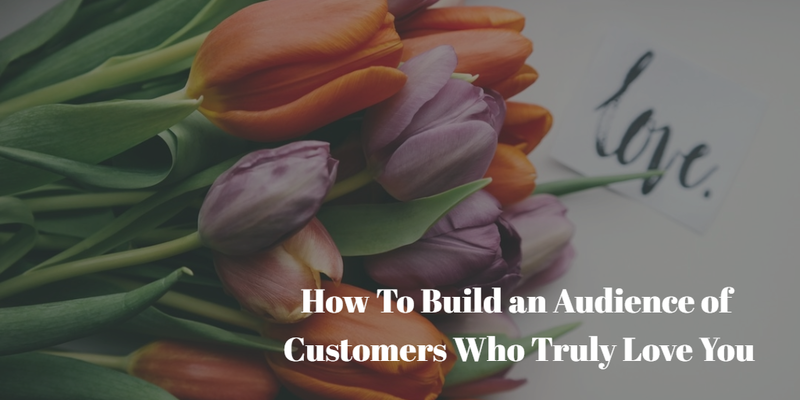 With this strategy, you’ll be cultivating a long-term relationship with customers that builds the goodwill and trust from them that you will ultimately be able to deliver on the promises they expect. The best online companies help to enable and allow their customers to create the content, services and products that will help them build their loyal customer base. Presently, this is being done to great effect in the nootropics niche. Take, for example, the company NaturalStacks.com, which used a forum thread on the popular website Longecity.org to develop their brain-enhancing nootropic, CILTEP. Here, a smart business heeded customer feedback to the extent of creating a brand new product to better serve those reported needs. If even that sounds like a bit more than you can presently handle, worry not. You can still engender a respectable degree of goodwill and trust from your customers by simply delivering on expectations and then some. That’s a two-part process: first, deliver on your customer’s expectations; then, give them a bit more than they even expected. This may come in the form of a bonus gift or a coupon toward a future purchase. It may come in the form of faster delivery, a money-back guarantee or lower prices. Include a short, return-addressed, postage-paid notecards requesting customer feedback on the service they received or on the delivery of their product. Follow-up with an automated email or phone call to check on continued satisfaction after a short time period has passed. None of these are difficult processes to begin. Each one of them can go a long way toward keeping your customers satisfied and then some. All the levels of customer service mentioned so far are the types that lead to customer referrals. When customers are treated even better than they expect, they tend to remember, and, more, they tend to share that surprising discovery with the people they care about. This is how customer service can garner your company those all-important referrals. When word-of-mouth remains one of the primary ways that new customers learn about almost any category of business, customer service is one area of running any business the value of which cannot be understated. Having said that, if you can’t surpass your customers’ expectations, then, at the very least, meet them. Deliver on the promises you explicitly make, so your customers know they can, at least, trust you at your word. Another way to look at it is that minimal customer service like this may not garner you the customer loyalty you want, but it will, at the very least, go a long way toward preventing a decline in your reputation and an ensuing decline in your customer base. Too many businesses view customers as the impediments to and distractions from their real business at hand. They see customers as annoyances and intrusions that must be dealt with so that they can get back to their “real” and “important” work. The problem is, the customers are the real business at hand, for, without them, there is no business. Avoiding and ignoring your customer is the surest way to sabotage your business. Contrarily, treating your customers with the utmost respect and appreciation, like they deserve, is a keystone to your business’s durability and growth.